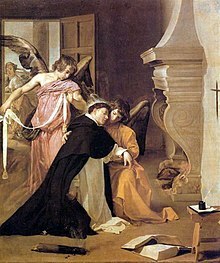 Saint Thomas Aquinas OP (; Italian: Tommaso d’Aquino, lit. ‘Thomas of Aquino‘; 1225  7 March 1274) was an ItalianDominican friar, Catholic priest, and Doctor of the Church. He was an immensely influential philosopher, theologian, and jurist in the tradition of scholasticism, within which he is also known as the Doctor Angelicus and the Doctor Communis. The name Aquinas identifies his ancestral origins in the county of Aquino in present-day Lazio. He was the foremost classical proponent of natural theology and the father of Thomism; of which he argued that reason is found in God. His influence on Western thought is considerable, and much of modern philosophy developed or opposed his ideas, particularly in the areas of ethics, natural law, metaphysics, and political theory. Unlike many currents in the Church of the time, Thomas embraced several ideas put forward by Aristotlewhom he called “the Philosopher”and attempted to synthesize Aristotelian philosophy with the principles of Christianity. The works for which he is best known are the Summa Theologiae and the Summa contra Gentiles. His commentaries on Scripture and on Aristotle form an important part of his body of work. Furthermore, Thomas is distinguished for his eucharistic hymns, which form a part of the Church’s liturgy. Thomas Aquinas is considered one of the Catholic Church’s greatest theologians and philosophers. Pope Benedict XV declared: “This (Dominican) Order … acquired new luster when the Church declared the teaching of Thomas to be her own and that Doctor, honored with the special praises of the Pontiffs, the master and patron of Catholic schools.” The English philosopher Anthony Kenny considers Thomas to be ‘one of the dozen greatest philosophers of the western world’. Thomas was most probably born in the castle of Roccasecca, located in Aquino, old county of the Kingdom of Sicily (present-day Lazio region, Italy), c.?1225. According to some authors, he was born in the castle of his father, Landulf of Aquino. Though he did not belong to the most powerful branch of the family, Landulf of Aquino was a man of means. As a knight in the service of King Roger II, he held the title miles. Thomas’s mother, Theodora, belonged to the Rossi branch of the Neapolitan Caracciolo family. Landulf’s brother Sinibald was abbot of the first Benedictine monastery at Monte Cassino. While the rest of the family’s sons pursued military careers, the family intended for Thomas to follow his uncle into the abbacy; this would have been a normal career path for a younger son of southern Italian nobility. At the age of nineteen Thomas resolved to join the recently founded Dominican Order. Thomas’s change of heart did not please his family. In an attempt to prevent Theodora’s interference in Thomas’s choice, the Dominicans arranged to move Thomas to Rome, and from Rome, to Paris. However, while on his journey to Rome, per Theodora’s instructions, his brothers seized him as he was drinking from a spring and took him back to his parents at the castle of Monte San Giovanni Campano. Thomas was held prisoner for almost one year in the family castles at Monte San Giovanni and Roccasecca in an attempt to prevent him from assuming the Dominican habit and to push him into renouncing his new aspiration. Political concerns prevented the Pope from ordering Thomas’s release, which had the effect of extending Thomas’s detention. Thomas passed this time of trial tutoring his sisters and communicating with members of the Dominican Order. Family members became desperate to dissuade Thomas, who remained determined to join the Dominicans. At one point, two of his brothers resorted to the measure of hiring a prostitute to seduce him. According to legend, Thomas drove her away wielding a fire iron. That night two angels appeared to him as he slept and strengthened his determination to remain celibate. By 1244, seeing that all of her attempts to dissuade Thomas had failed, Theodora sought to save the family’s dignity, arranging for Thomas to escape at night through his window. In her mind, a secret escape from detention was less damaging than an open surrender to the Dominicans. Thomas was sent first to Naples and then to Rome to meet Johannes von Wildeshausen, the Master General of the Dominican Order. Thomas taught in Cologne as an apprentice professor (baccalaureus biblicus), instructing students on the books of the Old Testament and writing Expositio super Isaiam ad litteram (Literal Commentary on Isaiah), Postilla super Ieremiam (Commentary on Jeremiah) and Postilla super Threnos (Commentary on Lamentations). Then in 1252 he returned to Paris to study for the master’s degree in theology. He lectured on the Bible as an apprentice professor, and upon becoming a baccalaureus Sententiarum (bachelor of the Sentences) devoted his final three years of study to commenting on Peter Lombard‘s Sentences. In the first of his four theological syntheses, Thomas composed a massive commentary on the Sentences titled Scriptum super libros Sententiarium (Commentary on the Sentences). Aside from his masters writings, he wrote De ente et essentia (On Being and Essence) for his fellow Dominicans in Paris. In the spring of 1256 Thomas was appointed regent master in theology at Paris and one of his first works upon assuming this office was Contra impugnantes Dei cultum et religionem (Against Those Who Assail the Worship of God and Religion), defending the mendicant orders, which had come under attack by William of Saint-Amour. During his tenure from 1256 to 1259, Thomas wrote numerous works, including: Questiones disputatae de veritate (Disputed Questions on Truth), a collection of twenty-nine disputed questions on aspects of faith and the human condition prepared for the public university debates he presided over on Lent and Advent;Quaestiones quodlibetales (Quodlibetal Questions), a collection of his responses to questions posed to him by the academic audience; and both Expositio super librum Boethii De trinitate (Commentary on Boethius’s De trinitate) and Expositio super librum Boethii De hebdomadibus (Commentary on Boethius’s De hebdomadibus), commentaries on the works of 6th-century Roman philosopher Boethius. By the end of his regency, Thomas was working on one of his most famous works, Summa contra Gentiles. In February 1265 the newly elected Pope Clement IV summoned Thomas to Rome to serve as papal theologian. This same year he was ordered by the Dominican Chapter of Agnani to teach at the studium conventuale at the Roman convent of Santa Sabina, founded some years before, in 1222. The studium at Santa Sabina now became an experiment for the Dominicans, the Order’s first studium provinciale, an intermediate school between the studium conventuale and the studium generale. Prior to this time the Roman Province had offered no specialized education of any sort, no arts, no philosophy; only simple convent schools, with their basic courses in theology for resident friars, were functioning in Tuscany and the meridionale during the first several decades of the order’s life. 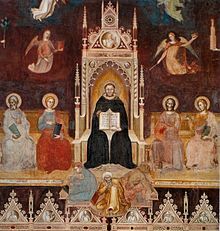 But the new studium at Santa Sabina was to be a school for the province”, a studium provinciale.Tolomeo da Lucca, an associate and early biographer of Thomas, tells us that at the Santa Sabina studium Thomas taught the full range of philosophical subjects, both moral and natural. While at the Santa Sabina studium provinciale Thomas began his most famous work, the Summa theologiae, which he conceived of specifically as suited to beginning students: “Because a doctor of Catholic truth ought not only to teach the proficient, but to him pertains also to instruct beginners. As the Apostle says in 1 Corinthians 3:12, as to infants in Christ, I gave you milk to drink, not meat, our proposed intention in this work is to convey those things that pertain to the Christian religion in a way that is fitting to the instruction of beginners.” While there he also wrote a variety of other works like his unfinished Compendium Theologiae and Responsio ad fr. Ioannem Vercellensem de articulis 108 sumptis ex opere Petri de Tarentasia (Reply to Brother John of Vercelli Regarding 108 Articles Drawn from the Work of Peter of Tarentaise). In his position as head of the studium Thomas conducted a series of important disputations on the power of God, which he compiled into his De potentia. Nicholas Brunacci was among Thomas’s students at the Santa Sabina studium provinciale and later at the Paris studium generale. In November 1268 he was with Thomas and his associate and secretary Reginald of Piperno, as they left Viterbo on their way to Paris to begin the academic year. Another student of Thomas’s at the Santa Sabina studium provinciale was Blessed Tommasello da Perugia. 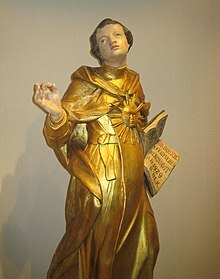 In 1268 the Dominican order assigned Thomas to be regent master at the University of Paris for a second time, a position he held until the spring of 1272. Part of the reason for this sudden reassignment appears to have arisen from the rise of “Averroism” or “radical Aristotelianism” in the universities. In response to these perceived errors, Thomas wrote two works, one of them being De unitate intellectus, contra Averroistas (On the Unity of Intellect, against the Averroists) in which he reprimands Averroism as incompatible with Christian doctrine. During his second regency, he finished the second part of the Summa and wrote De virtutibus and De aeternitate mundi, contra murmurantes (On the Eternity of the World, against Grumblers), the latter of which dealt with controversial Averroist and Aristotelian beginninglessness of the world. In 1272 Thomas took leave from the University of Paris when the Dominicans from his home province called upon him to establish a studium generale wherever he liked and staff it as he pleased. He chose to establish the institution in Naples, and moved there to take his post as regent master. He took his time at Naples to work on the third part of the Summa while giving lectures on various religious topics. He also preached to the people of Naples every day in Lent, 1273. These sermons on the commandments, the creed, the Our Father and Hail Mary were very popular. 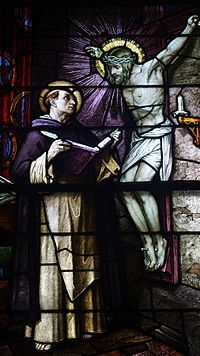 On one occasion, at 1273 at the Dominican convent of Naples in the chapel of Saint Nicholas, after Matins, Thomas lingered and was seen by the sacristan Domenic of Caserta to be levitating in prayer with tears before an icon of the crucified Christ. Christ said to Thomas, “You have written well of me, Thomas. What reward would you have for your labor?” Thomas responded, “Nothing but you, Lord.” After this exchange something happened, but Thomas never spoke of it or wrote it down. On 6 December 1273, another mystical experience took place. While he was celebrating Mass, he experienced an unusually long ecstasy. Because of what he saw, he abandoned his routine and refused to dictate to his socius Reginald of Piperno. When Reginald begged him to get back to work, Thomas replied: “Reginald, I cannot, because all that I have written seems like straw to me” (mihi videtur ut palea). As a result, the Summa Theologica would remain uncompleted. What exactly triggered Thomas’s change in behavior is believed by Catholics to have been some kind of supernatural experience of God. After taking to his bed, he did recover some strength. In 1054 the Great Schism had occurred between the Latin Church following the Pope (known as the Catholic Church) in the West, and the Patriarchate of Constantinople in the East (known as the Eastern Orthodox Church). Looking to find a way to reunite the Eastern Orthodox Church and the Catholic Church, Pope Gregory X convened the Second Council of Lyon to be held on 1 May 1274 and summoned Thomas to attend. At the meeting, Thomas’s work for Pope Urban IV concerning the Greeks, Contra errores graecorum, was to be presented. On his way to the Council, riding on a donkey along the Appian Way, he struck his head on the branch of a fallen tree and became seriously ill again. He was then quickly escorted to Monte Cassino to convalesce. After resting for a while, he set out again, but stopped at the Cistercian Fossanova Abbey after again falling ill. The monks nursed him for several days, and as he received his last rites he prayed: “I have written and taught much about this very holy Body, and about the other sacraments in the faith of Christ, and about the Holy Roman Church, to whose correction I expose and submit everything I have written.” He died on 7 March 1274 while giving commentary on the Song of Songs. In 1277 Étienne Tempier, the same bishop of Paris who had issued the condemnation of 1270, issued another more extensive condemnation. One aim of this condemnation was to clarify that God’s absolute power transcended any principles of logic that Aristotle or Averroes might place on it. More specifically, it contained a list of 219 propositions that the bishop had determined to violate the omnipotence of God, and included in this list were twenty Thomistic propositions. Their inclusion badly damaged Thomas’s reputation for many years. In the Divine Comedy, Dante sees the glorified soul of Thomas in the Heaven of the Sun with the other great exemplars of religious wisdom.Dante asserts that Thomas died by poisoning, on the order of Charles of Anjou; Villani (ix. 218) cites this belief, and the Anonimo Fiorentino describes the crime and its motive. But the historian Ludovico Antonio Muratori reproduces the account made by one of Thomas’s friends, and this version of the story gives no hint of foul play. Thomas’s theology had begun its rise to prestige. Two centuries later, in 1567, Pope Pius V proclaimed St. Thomas Aquinas a Doctor of the Church and ranked his feast with those of the four great Latin fathers: Ambrose, Augustine of Hippo, Jerome and Gregory. At the Council of Trent, Thomas had the honor of having his Summa theologiae placed on the altar alongside the Bible and the Decretals. In his encyclical of 4 August 1879, Aeterni Patris, Pope Leo XIII stated that Thomas Aquinas’s theology was a definitive exposition of Catholic doctrine. Thus, he directed the clergy to take the teachings of Thomas as the basis of their theological positions. Leo XIII also decreed that all Catholic seminaries and universities must teach Thomas’s doctrines, and where Thomas did not speak on a topic, the teachers were “urged to teach conclusions that were reconcilable with his thinking.” In 1880, Saint Thomas Aquinas was declared patron of all Catholic educational establishments. When the devil’s advocate at his canonization process objected that there were no miracles, one of the cardinals answered, “Tot miraculis, quot articulis“”there are as many miracles (in his life) as articles (in his Summa)”. Fifty years after Thomas’s death, on 18 July 1323, Pope John XXII, seated in Avignon, pronounced Thomas a saint. Thomas Aquinas was a theologian and a Scholastic philosopher. However, he never considered himself a philosopher, and criticized philosophers, whom he saw as pagans, for always “falling short of the true and proper wisdom to be found in Christian revelation.” With this in mind, Thomas did have respect for Aristotle, so much so that in the Summa, he often cites Aristotle simply as “the Philosopher.” Much of his work bears upon philosophical topics, and in this sense may be characterized as philosophical. Thomas’ philosophical thought has exerted enormous influence on subsequent Christian theology, especially that of the Catholic Church, extending to Western philosophy in general. Thomas stands as a vehicle and modifier of Aristotelianism and Neoplatonism. It is said that Thomas modified both Aristotelianism and Neoplatonism by way of heavy reliance on the Pseudo-Dionysius. Thomas Aquinas wrote several important commentaries on Aristotle‘s works, including On the Soul, Nicomachean Ethics and Metaphysics. His work is associated with William of Moerbeke‘s translations of Aristotle from Greek into Latin. Virtue denotes a certain perfection of a power. Now a thing’s perfection is considered chiefly in regard to its end. But the end of power is act. Wherefore power is said to be perfect, according as it is determinate to its act. all acts of virtue are prescribed by the natural law: since each one’s reason naturally dictates to him to act virtuously. But if we speak of virtuous acts, considered in themselves, i.e., in their proper species, thus not all virtuous acts are prescribed by the natural law: for many things are done virtuously, to which nature does not incline at first; but that, through the inquiry of reason, have been found by men to be conductive to well living.” Therefore, we must determine if we are speaking of virtuous acts as under the aspect of virtuous or as an act in its species. The desires to live and to procreate are counted by Thomas among those basic (natural) human values on which all human values are based. According to Thomas, all human tendencies are geared towards real human goods. In this case, the human nature in question is marriage, the total gift of oneself to another that ensures a family for children and a future for mankind. He defined the dual inclination of the action of love: “towards the good which a man wishes to someone (to himself or to another) and towards that to which he wishes some good”. Concerning the Human Law, Thomas concludes, “…that just as, in the speculative reason, from naturally known indemonstrable principles, we draw the conclusions of the various sciences, the knowledge of which is not imparted to us by nature, but acquired by the efforts of reason, so to it is from the precepts of the natural law, as from general and indemonstrable principles, that human reason needs to proceed to the more particular determination of certain matters. These particular determinations, devised by human reason, are called human laws, provided the other essential conditions of law be observed….” Human law is positive law: the natural law applied by governments to societies. Thomas’s theory of political order became highly influential. He sees man as a social being that lives in a community and interacts with its other members. That leads, among other things, to the division of labour. The kings are God’s representatives in their territories. But the church, represented by the popes, is above the kings in matters of doctrine and morality. As a consequence, the kings and other worldly rulers are obliged to adapt their laws to the Catholic church’s doctrines and ethics. For example, the worldly authorities have to execute persons whom the church has sentenced to death for heresy and they have to fight and subdue groups of heretics such as the Albigenses and Waldensians to restore the unity of the church. Following Aristotle’s concept of slavery, Thomas justifies this institution on the grounds of natural law. Thomas Aquinas maintains that a human is a single material substance. He understands the soul as the form of the body, which makes a human being the composite of the two. Thus, only living, form-matter composites can truly be called human; dead bodies are “human” only analogously. One actually existing substance comes from body and soul. A human is a single material substance, but still should be understood as having an immaterial soul, which continues after bodily death. The soul is a “substantial form“; it is a part of a substance, but it is not a substance by itself. Nevertheless, the soul exists separately from the body, and continues, after death, in many of the capacities we think of as human. Substantial form is what makes a thing a member of the species to which it belongs, and substantial form is also the structure or configuration that provides the object with the abilities that make the object what it is. For humans, those abilities are those of the rational animal. These distinctions can be better understood in the light of Thomas’s understanding of matter and form, a hylomorphic (“matter/form”) theory derived from Aristotle. In any given substance, matter and form are necessarily united, and each is a necessary aspect of that substance. However, they are conceptually separable. Matter represents what is changeable about the substancewhat is potentially something else. For example, bronze matter is potentially a statue, or also potentially a cymbal. Matter must be understood as the matter of something. In contrast, form is what determines some particular chunk of matter to be a specific substance and no other. When Thomas says that the human body is only partly composed of matter, he means the material body is only potentially a human being. The soul is what actualizes that potential into an existing human being. Consequently, the fact that a human body is live human tissue entails that a human soul is wholly present in each part of the human. 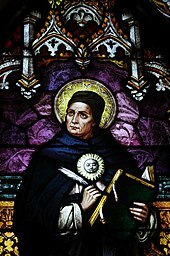 Thomas Aquinas viewed theology, or the sacred doctrine, as a science, the raw material data of which consists of written scripture and the tradition of the Catholic Church. These sources of data were produced by the self-revelation of God to individuals and groups of people throughout history. Faith and reason, while distinct but related, are the two primary tools for processing the data of theology. Thomas believed both were necessaryor, rather, that the confluence of both was necessaryfor one to obtain true knowledge of God. Thomas blended Greek philosophy and Christian doctrine by suggesting that rational thinking and the study of nature, like revelation, were valid ways to understand truths pertaining to God. According to Thomas, God reveals himself through nature, so to study nature is to study God. The ultimate goals of theology, in Thomas’s mind, are to use reason to grasp the truth about God and to experience salvation through that truth. Thomas believed that truth is known through reason (natural revelation) and faith (supernatural revelation). Supernatural revelation has its origin in the inspiration of the Holy Spirit and is made available through the teaching of the prophets, summed up in Holy Scripture, and transmitted by the Magisterium, the sum of which is called “Tradition”. Natural revelation is the truth available to all people through their human nature and powers of reason. For example, he felt this applied to rational ways to know the existence of God. Revealed knowledge does not negate the truth and the completeness of human science as human, it further establishes them. First, it grants that the same things can be treated from two different perspectives without one canceling the other; thus there can be two sciences of God. Second, it provides the basis for the two sciences: one functions through the power of the light of natural reason, the other through the light of divine revelation. Moreover, they can, at least to some extent, keep out of each other’s way because they differ “according to genus”. Sacred doctrine is a fundamentally different kind of thing from theology, which is part of philosophy (ST I. 1.1 ad 2). The same thing is true of those substances Empedocles said were produced at the beginning of the world, such as the ‘ox-progeny’, i.e., half ox and half man. For if such things were not able to arrive at some end and final state of nature so that they would be preserved in existence, this was not because nature did not intend this , but because they were not capable of being preserved. For they were not generated according to nature, but by the corruption of some natural principle, as it now also happens that some monstrous offspring are generated because of the corruption of seed. God is perfect, lacking nothing. That is, God is distinguished from other beings on account of God’s complete actuality. Thomas defined God as the ‘Ipse Actus Essendi subsistens,’ subsisting act of being. God is immutable, incapable of change on the levels of God’s essence and character. Following St. Augustine of Hippo, Thomas defines sin as “a word, deed, or desire, contrary to the eternal law.” It is important to note the analogous nature of law in Thomas’s legal philosophy. Natural law is an instance or instantiation of eternal law. Because natural law is what human beings determine according to their own nature (as rational beings), disobeying reason is disobeying natural law and eternal law. Thus eternal law is logically prior to reception of either “natural law” (that determined by reason) or “divine law” (that found in the Old and New Testaments). In other words, God’s will extends to both reason and revelation. Sin is abrogating either one’s own reason, on the one hand, or revelation on the other, and is synonymous with “evil” (privation of good, or privatio boni). Thomas, like all Scholastics, generally argued that the findings of reason and data of revelation cannot conflict, so both are a guide to God’s will for human beings. Thomas’s five proofs for the existence of God take some of Aristotle’s assertions concerning principles of being. For God as prima causa (“first cause”) comes from Aristotle’s concept of the unmoved mover and asserts that God is the ultimate cause of all things. Thomas argued against several specific contemporary and historical theologians who held differing views about Christ. In response to Photinus, Thomas stated that Jesus was truly divine and not simply a human being. Against Nestorius, who suggested that Son of God was merely conjoined to the man Christ, Thomas argued that the fullness of God was an integral part of Christ’s existence. However, countering Apollinaris‘s views, Thomas held that Christ had a truly human (rational) soul, as well. This produced a duality of natures in Christ. Thomas argued against Eutyches that this duality persisted after the Incarnation. Thomas stated that these two natures existed simultaneously yet distinguishably in one real human body, unlike the teachings of Manichaeus and Valentinus. With respect to Saint Paul’s assertion that Christ, “though he was in the form of God… emptied himself” (Philippians 2:67) in becoming human, Thomas offered an articulation of divine kenosis that has informed much subsequent Catholic Christology. Following the Council of Nicaea, Saint Augustine of Hippo, as well as the assertions of Scripture, Thomas held the doctrine of divine immutability. Hence, in becoming human, there could be no change in the divine person of Christ. For Thomas, “the mystery of Incarnation was not completed through God being changed in any way from the state in which He had been from eternity, but through His having united Himself to the creature in a new way, or rather through having united it to Himself.” Similarly, Thomas explained that Christ “emptied Himself, not by putting off His divine nature, but by assuming a human nature.” For Thomas, “the divine nature is sufficiently full, because every perfection of goodness is there. But human nature and the soul are not full, but capable of fulness, because it was made as a slate not written upon. Therefore, human nature is empty.” Thus, when Paul indicates that Christ “emptied himself” this is to be understood in light of his assumption of a human nature. In short “Christ had a real body of the same nature of ours, a true rational soul, and, together with these, perfect Deity.” Thus, there is both unity (in his one hypostasis) and composition (in his two natures, human and Divine) in Christ. The goal of union with God has implications for the individual’s life on earth. Thomas stated that an individual’s will must be ordered toward right things, such as charity, peace, and holiness. He saw this orientation as also the way to happiness. Indeed, Thomas ordered his treatment of the moral life around the idea of happiness. The relationship between will and goal is antecedent in nature “because rectitude of the will consists in being duly ordered to the last end .” Those who truly seek to understand and see God will necessarily love what God loves. Such love requires morality and bears fruit in everyday human choices. Heresy was a capital offense against the secular law of most European countries of the 13th century, which had a limited prison capacity. Kings and emperors, even those at war with the papacy, listed heresy first among the crimes against the state. Kings claimed power from God according to the Christian faith. Often enough, especially in that age of papal claims to universal worldly power, the rulers’ power was tangibly and visibly legitimated directly through coronation by the pope. For Jews, Thomas argues for toleration, not only of their persons but also of their public rites. A grasp of Thomas’s psychology is essential for understanding his beliefs around the afterlife and resurrection. Thomas, following Church doctrine, accepts that the soul continues to exist after the death of the body. Because he accepts that the soul is the form of the body, then he also must believe that the human being, like all material things, is form-matter composite. Substantial form (the human soul) configures prime matter (the physical body) and is the form by which a material composite belongs to that species it does; in the case of human beings, that species is rational animal. So, a human being is a matter-form composite that is organized to be a rational animal. Matter cannot exist without being configured by form, but form can exist without matterwhich allows for the separation of soul from body. Thomas says that the soul shares in the material and spiritual worlds, and so has some features of matter and other, immaterial, features (such as access to universals). The human soul is different from other material and spiritual things; it is created by God, but also only comes into existence in the material body. Resurrection appears to require dualism, which Thomas rejects. Yet Thomas believes the soul persists after the death and corruption of the body, and is capable of existence, separated from the body between the time of death and the resurrection. Thomas believes in a different sort of dualism, one guided by Christian scripture. Thomas knows that human beings are essentially physical, but physicality has a spirit capable of returning to God after life. For Thomas, the rewards and punishment of the afterlife are not only spiritual. Because of this, resurrection is an important part of his philosophy on the soul. The human is fulfilled and complete in the body, so the hereafter must take place with souls enmattered in resurrected bodies. In addition to spiritual reward, humans can expect to enjoy material and physical blessings. Because Thomas’s soul requires a body for its actions, during the afterlife, the soul will also be punished or rewarded in corporeal existence. Thomas states clearly his stance on resurrection, and uses it to back up his philosophy of justice; that is, the promise of resurrection compensates Christians who suffered in this world through a heavenly union with the divine. He says, “If there is no resurrection of the dead, it follows that there is no good for human beings other than in this life.” Resurrection provides the impetus for people on earth to give up pleasures in this life. Aquinas believes the human who prepared for the afterlife both morally and intellectually will be rewarded more greatly; however, all reward is through the grace of God. Thomas insists beatitude will be conferred according to merit, and will render the person better able to conceive the divine. Thomas accordingly believes punishment is directly related to earthly, living preparation and activity as well. Thomas’s account of the soul focuses on epistemology and metaphysics, and because of this he believes it gives a clear account of the immaterial nature of the soul. Thomas conservatively guards Christian doctrine, and thus maintains physical and spiritual reward and punishment after death. By accepting the essentiality of both body and soul, he allows for a heaven and hell described in scripture and church dogma. Many modern ethicists both within and outside the Catholic Church (notably Philippa Foot and Alasdair MacIntyre) have recently commented on the possible use of Thomas’s virtue ethics as a way of avoiding utilitarianism or Kantian “sense of duty” (called deontology). Through the work of twentieth-century philosophers such as Elizabeth Anscombe (especially in her book Intention), Thomas’s principle of double effect specifically and his theory of intentional activity generally have been influential. Henry Adams‘s Mont Saint Michel and Chartres ends with a culminating chapter on Thomas, in which Adams calls Thomas an “artist” and constructs an extensive analogy between the design of Thomas’s “Church Intellectual” and that of the gothic cathedrals of that period. Erwin Panofsky later would echo these views in Gothic Architecture and Scholasticism (1951). Thomas’s aesthetic theories, especially the concept of claritas, deeply influenced the literary practice of modernist writer James Joyce, who used to extol Thomas as being second only to Aristotle among Western philosophers. 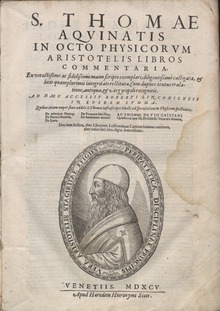 Joyce refers to Thomas’s doctrines in Elementa philosophiae ad mentem D. Thomae Aquinatis doctoris angelici (1898) of Girolamo Maria Mancini, professor of theology at the Collegium Divi Thomae de Urbe. For example, Mancini’s Elementa is referred to in Joyce’s Portrait of the Artist as a Young Man. The influence of Thomas’s aesthetics also can be found in the works of the Italian semiotician Umberto Eco, who wrote an essay on aesthetic ideas in Thomas (published in 1956 and republished in 1988 in a revised edition). This critique is illustrated on the following examples: According to Russell, Thomas advocates the indissolubility of marriage “on the ground that the father is useful in the education of the children, (a) because he is more rational than the mother, (b) because, being stronger, he is better able to inflict physical punishment.” Even though modern approaches to education do not support these views, “No follower of Saint Thomas would, on that account, cease to believe in lifelong monogamy, because the real grounds of belief are not those which are alleged.” It may be countered that the treatment of matrimony in the Summa Theologica is in the Supplements volume, which was not written by Thomas. Moreover, as noted above, Thomas’s introduction of arguments and concepts from the pagan Aristotle and Muslim Averroes was controversial within the Catholic Church of his day. 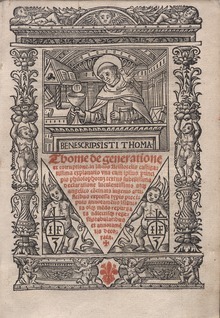 The first edition of Thomas’s opera omnia, the so-called editio Piana (from Pius V, the Dominican Pope who commissioned it), was produced in 1570 at the studium of the Roman convent at Santa Maria sopra Minerva, the forerunner of the Pontifical University of Saint Thomas Aquinas, Angelicum. The critical edition of Thomas’s works is the ongoing edition commissioned by Pope Leo XIII (18821903), the so-called Leonine Edition. Most of his major works have now been edited, the Summa Theologiae in nine volumes during 18881906, the Summa contra Gentiles in three volumes during 19181930.